We had Family Night, Friday night and it was a blast! 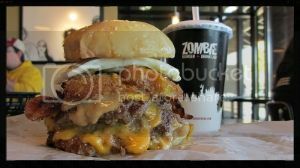 We began our evening at Zombie Burger. If you have not been, you definitely need to check it out! They have awesome, crazy burgers and even crazier, spiked milkshakes. I enjoyed a Cinnamon Toast Crunch shake spiked with Rum Chata … delish! Travis ordered the Undead Elvis … which includes peanut butter, fried bananas, bacon, american cheese, egg, mayo, and somewhere on there … a hamburger patty! After dinner, we made our way to the Science Center of Iowa! 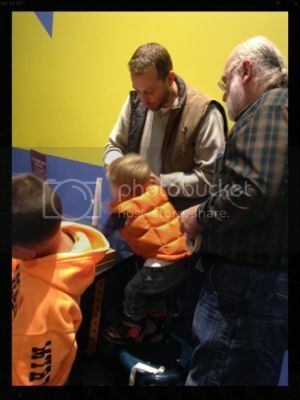 They opened the Dinosaur Exhibit during Family Night. Family Night is the second Friday of every month 5 pm – 8 pm and it’s only $5. It’s a great thing, when you cannot make it to the Science Center during the day and it’s an awesome family night activity. As a Science Center member you can enter in at 4 pm to see the exhibit early, before the crowd hits. Also, as a member, the $5 entrance fee is waived. You also get free registration on monthly member family workshops. You can view upcoming workshops here. We started out exploring in the Small Discoveries area. Monte loves this area and it’s perfect for toddlers. 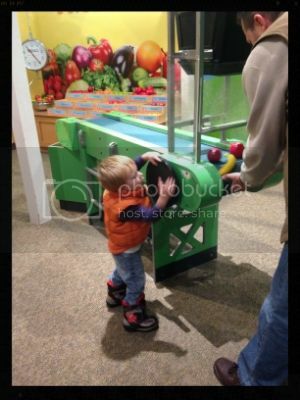 He loves the fruit and vegetable activity AND the bubble activity. The dinosaur exhibit was pretty awesome. There is something for everyone, it does not matter your age! Monte was pretty much only interested in the large dinosaurs and hands on things. 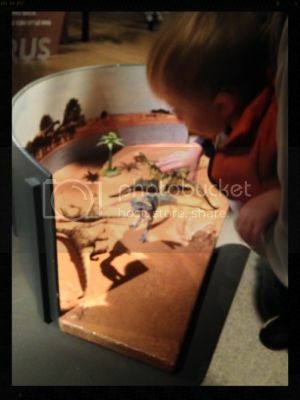 The exhibit does a great job explaining everything with videos, pictures, and large dinosaurs! If there are questions there is someone available to ask. There are a lot of hands on things for the kiddos. Monte’s favorite were the stamps. At the beginning of the tour there are sheets of paper with six squares to fill. Each square is a different type of dinosaur. When you walk through the exhibit you look for that type of dinosaur and somewhere near by is a stamp to stamp your sheet. Each stamp is white and looks more like a fossil then a stamp. It helps keep the kids involved and interested. There were also smaller, toy dinosaurs you could play with! After we toured the exhibit, we made our way upstairs to check out the When Things Get Moving area. You could spend hours in this area. You can build cars with legos and have races, build rockets and launch them, wrap an “egg” and drop it to see if it will break, dominoes, and much more! 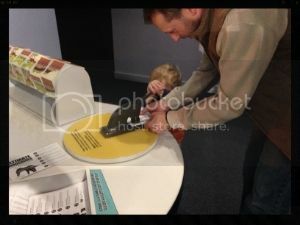 If you have young kiddos and are not a member of the Science Center of Iowa, I definitely recommend becoming a member! I love taking Monte when it is cold and dreary out. We can spend a good 3 hours or more keeping busy with all the activities. It definitely pays for itself quickly! You get a discount on IMAX films, discount in the store, discount at the Food Chain Cafe, and more! There are also events that happen which are included with your membership. One event that is coming up on October 25th is Spooky Science. 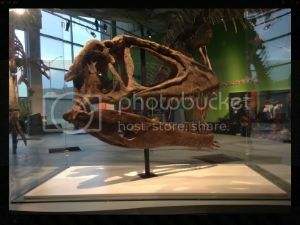 A perfect event for your kiddos to get dressed up in their costumes and check out the Science Center of Iowa. For more information about becoming a member, check it out here! 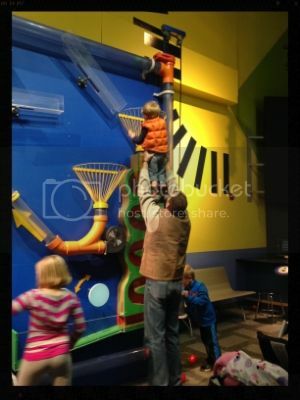 What is your favorite thing to do at the Science Center of Iowa?